Saturday, 15 December 2018, 2:35p.m. We're familiar with the saying "eat like the Queen," and most people assume this means exquisite dining, but what does the Queen actually eat? Her Majesty may have access to the best chefs in the United Kingdom as soon as any craving may strike, yet according to Darren McGrady her former private chef, her day on a plate is far from extraordinary. According to Tatler magazine, McGrady said she's no foodie, instead "she eats to live." The way it works in Buckingham Palace is he'd create a menu book which would be sent to the Queen so she could select what she desired. "The book would come back to the kitchen and we'd prepare them. The Queen's menus are done three or more days ahead and she sticks with them religiously," McGrady told Tatler magazine. 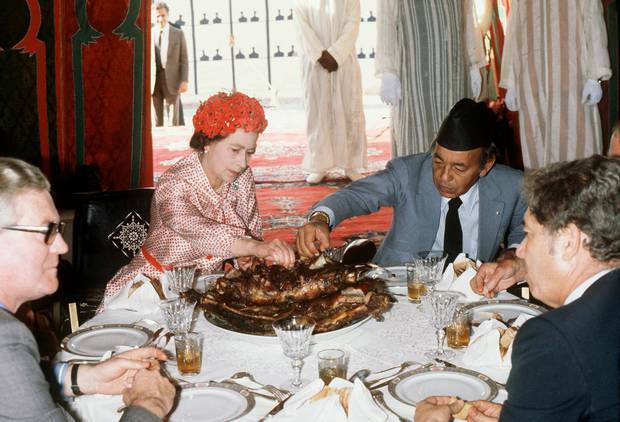 So what's a typical day on a plate for the Queen? McGrady told the Telegraph, "The Queen loved scrambled eggs with smoked salmon and a grating of truffle. But she was too frugal to ever order fresh truffles and only really enjoyed them at Christmas when the truffles were sent as a gift." Mostly, she'd choose something simple, such as "regular cereal like Special K with fresh fruit". She required the fruit be stored in Tupperware to remain fresh, and she preferred to serve it herself. Her lunch choice is equally as straightforward: "Something simple, like fish with vegetables," said McGrady. "She likes to eat grilled Dover sole with wilted spinach or courgettes" or a "simple grilled chicken with salad." A former palace chef from the early 90s said tuna sandwiches were also her favourite for this time of day. Always cut into eight identical triangles with the bread buttered on both sides. However, on Sundays, she enjoys a roast meal and is more inclined towards a well-done slice over rare. Different from her breakfast and lunch, this meal satisfies our expectation of how the Queen would eat. After all, it makes sense the British tradition of afternoon tea is celebrated by the Queen every day. The Queen consistently takes tea accompanied by a superb spread. "She'll have a fine selection of finger sandwiches, such as cucumber, egg and mayo, smoked salmon, with all the crusts removed - served alongside jam pennies (tiny raspberry jam sandwiches cut into the size of a penny). Cakes include chocolate biscuit cake, honey and cream sponge, ginger, and fruit, as well as scones and, rather surprisingly, Rich Tea biscuits (an iconic biscuit in the UK, consumed after tea, before tea and as snacks). One food the Queen has no tolerance for? Garlic. Which means you'll never find a gourmet garlic bread on her dinner table. McGrady revealed there was "never garlic on the menu. She hated the smell of it, she hated the taste of it." Rather, her dinnertime meals often consist of food from the estate: "game birds, pheasants, grouse, partridge - she loved those to be on the menu." For dessert, something we can relate to: the Queen loves a chocolatey indulgence. "She loves chocolate. That was her favourite, and it has to be dark chocolate. The darker the chocolate, the better", said McGrady, whose chocolate mousse and traditional chocolate ganache sponge cake always went down a treat in the palace.